The pressure is escalating against the development of China as a global factor. At the same time the Pentagon released its 2018 US National Security Strategy paper explicitly targeting Russia and China as prime USA strategic threat overshadowing that from international terrorism, India, a member of a new alliance fostered recently by Washington to target China, hosted the third international Raisina Dialogue conference. The primary theme was China as “disruptor” power in the world and what to do about that .	. The true nature of the three-day meeting in New Delhi was obscured in press accounts but research revealed an extraordinary coming together of forces and interests opposed to China’s game-altering Belt, Road Initiative—the new Economic Silk Road Initiative. 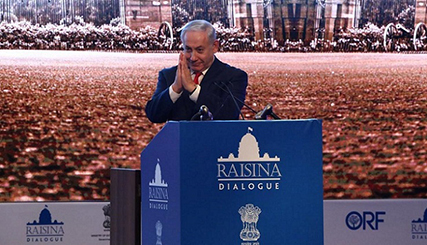 Most notable was the fact that Indian Prime Minister Narenda Modi, keynote speaker at the Raisina Dialogue in 2017 this year gave the center stage to his “good friend” Israeli Prime Minister Benjamin Netanyahu. It was not to foster peaceful development across Asia. The theme of the Raisina Dialogue, sponsored by the Indian Ministry of External Affairs and Observer Research Foundation (ORF), a leading Indian geopolitical think tank, was ‘Managing Disruptive Transitions.’ The number one “disruptive transition” they discussed was China and China’s Belt, Road Initiative (BRI), sometimes called the new Economic Silk Road. Most notable is who was attending the major New Delhi talks. Among others in addition to Netanyahu was Carl Bildt, former Swedish Foreign Minister and adviser to Ukraine oligarch president Poroshenko who also sits on the board of George Soros’ European Council on Foreign Relations. Hamad Karzai, Washington’s choice as President of Afghanistan was present as was former Canada PM Stephen Harper, who has been called a Canadian neo-conservative, close to Netanyahu policies and openly Russia-phobic. NATO was there at a very high level with Admiral Harry Harris, Commander, US Pacific Command, and UK General Chris Deverell, the Joint Forces Commander. Indicating the underlying nature of the Raisina gathering, the navy chiefs from the four “Quad” countries – Japan, Australia, India and the US – the four countries that Washington is bringing together to counter China’s Belt, Road, were in full force. As well there was retired US general David Petraeus, the former CIA Director, and architect of the Iraq US military operations that gave rise to Al Qaeda in Iraq as well as the US military debacle in Afghanistan. Alarming were the remarks of Israeli Prime Minister Netanyahu who called for an alliance of Israel, India and what he called an “alliance of democracies” (sic) to “strengthen our relationships as our way of life is being challenged by radical Islam.” The focus on “radical Islam” was code for the India concern that Islamic Pakistan is a cooperation partner with China in the China-India Economic Corridor of the BRI. 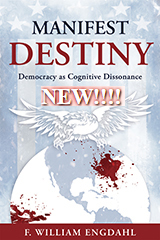 The real substance of the New Delhi gathering was to congeal a strategy of containment of China using a new coalition of four states—Japan, India, Australia and the United States. In November, 2017 during the visit of the US President in a Manila summit, the four agreed to closely coordinate measures to contain China. These four announced they had formed a coalition to patrol the disputed East and South China Seas where China is making territorial claims. The US has even changed the designation of the region from Asia-Pacific to Indo-Pacific to focus on the role of India. The New Delhi talks were a direct consequence of the new Quad strategy as is the new Pentagon Defense Strategy 2018 which explicitly targets China along with Russia as guilty of disturbing Washington’s “rules based order” with what the Pentagon calls China’s “predatory economics” along its Belt, Road Initiative. Former US Ambassador to Iraq and to Afghanistan, neo-con ideologue Zalmay Khalilzad attacked China’s Belt,Road Initiative claiming that by connecting all of Eurasia it would “change the international order.” Admiral Katsutoshi Kawano, Chief of Staff of the Japan Joint Staff, said Beijing is changing the status quo in the Pacific and the Indian Ocean, and it is important for countries in the area to close ranks against it, claiming that China’s Belt and Road initiative aims at military expansion. As the New Delhi conference was ongoing tensions between India and Pakistan over China’s China-Pakistan Economic Corridor, a $50 billion infrastructure corridor of the China BRI, which passes through Pakistan’s section of Jammu and Kashmir, Pakistan’s only land link to China, escalated. China is offering to meet with India to discuss differences, while India accuses Pakistan of illegal border violations along the un-demarcated Line of Control across the mountains of Jammu and Kashmir. Indian chief of Army, Bipin Rawat has announced that Indian troops have begun targeting Pakistani border posts, and refused Pakistani requests for negotiations over the escalation. Washington can quietly stay in the background, encouraging escalation of tensions between its Quad allies and China’s Silk Road or BRI. The escalation of tensions in Pakistan, in Afghanistan and in Myanmar all beat the pawprints of Washington dirty tricks. The losers in such an escalation will be all of Asia, not merely China.